At the airport, Sally & Tyson find out Portugal is actually in South America. And the teams get on a flight to Lisbon through Frankfurt. Teams arrive in Lisbon at 10pm and must now head to the Torre de Belém where they find the next clue. Teams must now learn and perform a Fado duet which they will learn with the help of an mp3 player before performing it in Portuguese for the professionals. They will be judged on lyrics and melody. They get started and Carla & Hereni decide to give it a go first. The singer asks them to try again. Ashleigh & Jarrod are next, but also get the thumbs down. Sally & Tyson go before Ashleigh & Jarrod try again. Jesse is excited because this is his challenge, him being a rocker and singing in a cover band. He helps Cat who is less musically inclined, but when they get to the performance it is Jesse who messes up. Daniel & Ryan are next and as soon as the beautiful singer joins it, it’s a sure thumbs up. They open the next clue telling them to take a taxi to Sant’Anna Boutique where they will hop on the historic Tram 28 to the terrace at Largo Das Portas Do Sol. Sally & Tyson, Carla & Hereni and Ashleigh & Jarrod are finished next, leaving Cat and a frustrated Jesse in last. Teams get to the tram stop at Sant’Anna Boutique, but the trams have already stopped running for the night. All teams are on the same tram in the morning and they get to the terrace where they find the Detour. For both sides of the Detour, teams must navigate the maze of streets in Lisbon. 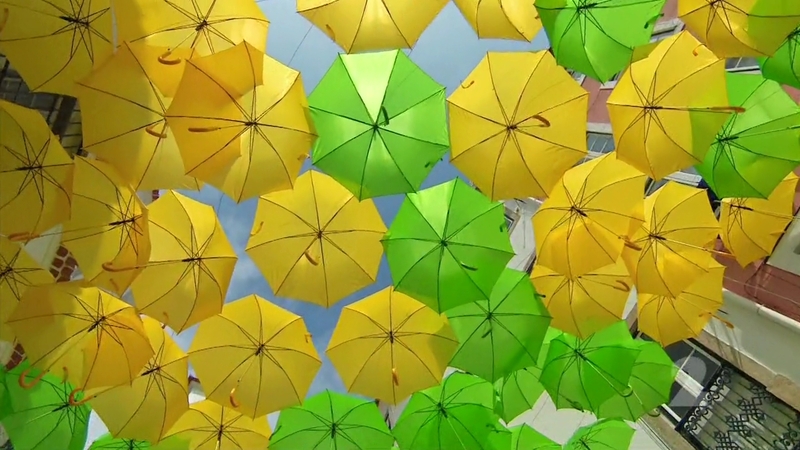 In Wet, teams must correctly count the number of yellow umbrellas amongst thousands of brightly colored umbrellas hung in the air for the local Agueda festival. In Dry, teams must collect a washing basket from one of five local ladies. They must then search a washing line for a piece of clothing with their lady’s name. All the teams quickly choose Wet. Sally & Tyson and Daniel & Ryan team up, as do Cat & Jesse and Carla & Hereni. Ashleigh & Jarrod decide to switch over to Dry in the hopes of getting ahead. They choose Florinda’s basket and start rolling through the clotheslines, but can’t even find one name. On their 2nd attempt, Daniel & Ryan write down 297 and the man says that is correct. They quickly tell Sally & Tyson. Teams must now choose a marked vehicle and drive themselves to Fisherman’s Beach in Cascais. The two Aussie teams decide to pay a taxi to lead them. Meanwhile, the other Aussie team is struggling. Ashleigh and Jarrod argue over whether or not to switch back to the umbrellas. They ultimately do. At the umbrellas, the Kiwis finally get the correct number and they are off. Ashleigh & Jarrod are now alone and last and they start counting. 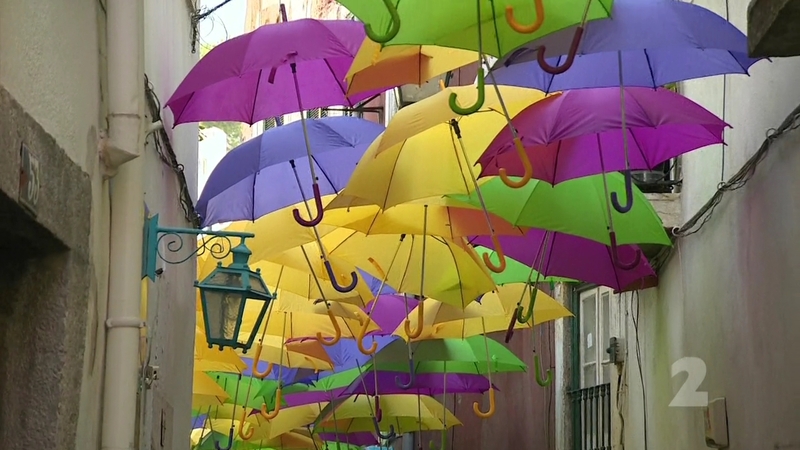 ALL of the umbrellas. They think they see a sign that says 888, so they give a try, but it is wrong. Ashleigh & Jarrod then meet a group of local ladies who tell them 3000 sunshades. And the man checking the chalkboard just laughs at them. Across town, Sally has a feeling something wasn’t right. She asks Tyson to stop so she can talk to the taxi driver and it turns out they were heading somewhere else. That allows the Kiwi teams to arrive first and they find the Road Block. For this Road Block, teams must sauce and deliver two kilos of mussels, one large fish and five kilos of octopus to a local restaurant. 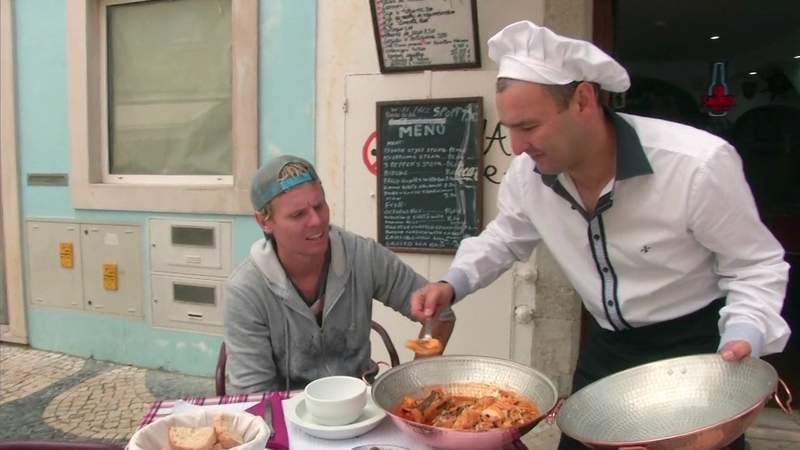 Once the chef is satisfied with the quantities, teams must finish a portion of Cataplana, a Portuguese fish stew. Hereni and Cat decide to do the Road Block and get started. Carla wonders where the Aussies are. Sally & Tyson and Daniel & Ryan again realize they are going the wrong way and Sally realizes she hadn’t stipulated to the taxi driver Fisherman’s Beach at Cascais. Sally now feels absolutely horrible. Ashleigh & Jarrod are still counting the umbrellas. ALL the umbrellas. That is until Ashleigh rereads the clue to see they only need to count YELLOW umbrellas. Ashleigh would’ve preferred to stay or go back to the laundry, Jarrod just wants to get this done. 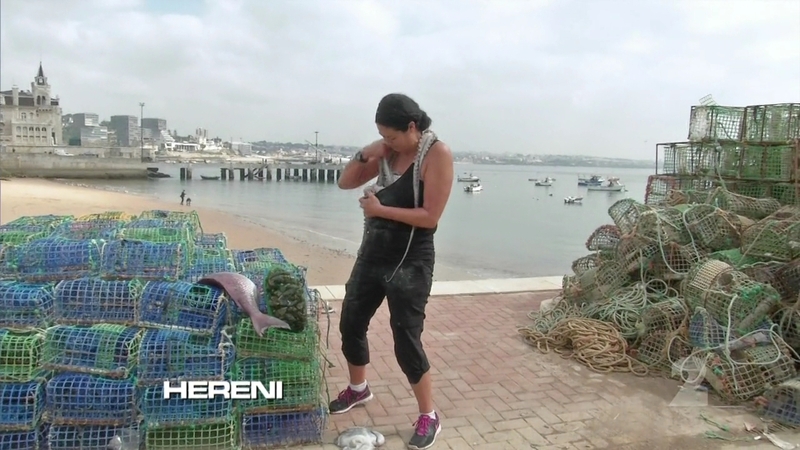 Hereni is stuffing the seafood in her tank top while Cat uses her vest as a handbag. That’s when the Aussies arrive and Ryan and Tyson decide to do the Road Block. Hereni recruits some French people to help while Cat follows Ryan and Tyson. Ashleigh & Jarrod again ask some locals for the answer and they give them the correct answer. The locals applaud and they are off. 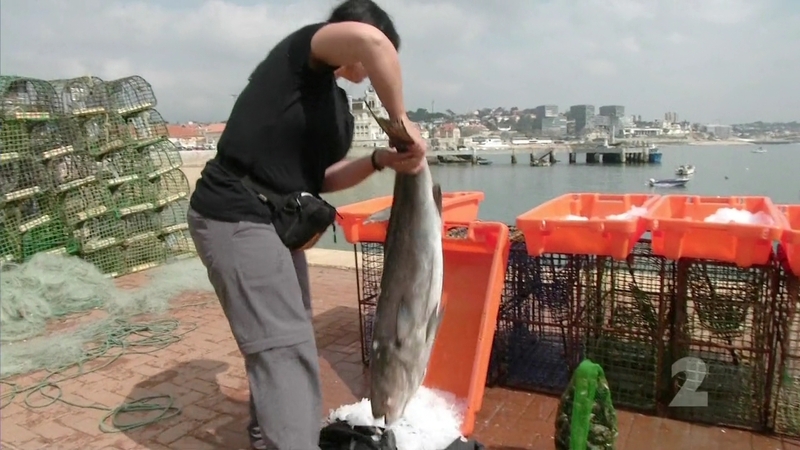 Hereni arrives at the restaurant, but is 100 grams short of octopus. Tyson and Ryan arrive at the restaurant. Ryan is also 100 grams short. But Tyson, who had made sure to get huge octopus is approved to start eating the dish. Cat arrives at the restaurant and she gets approved as well. Hereni gets back and she starts shoving in the soup while Cat enjoys her meal. 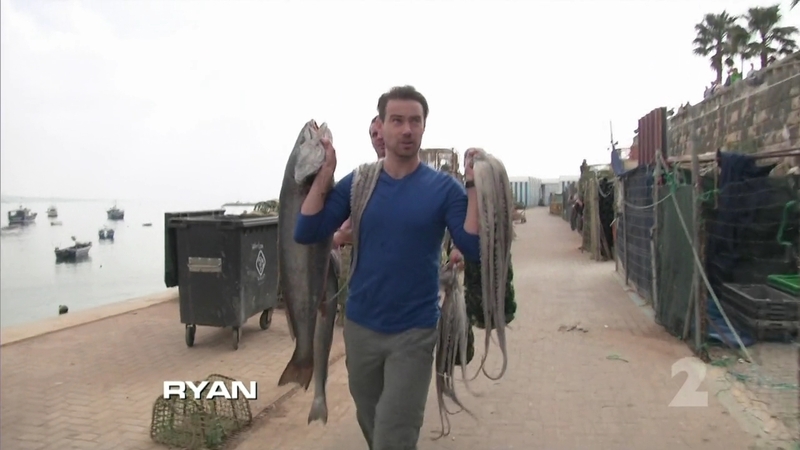 Tyson finishes the bowl as Ryan arrives with his octopus. Hereni gets done 2nd and Ryan finishes before Cat who decides to toss her vest on her way back. 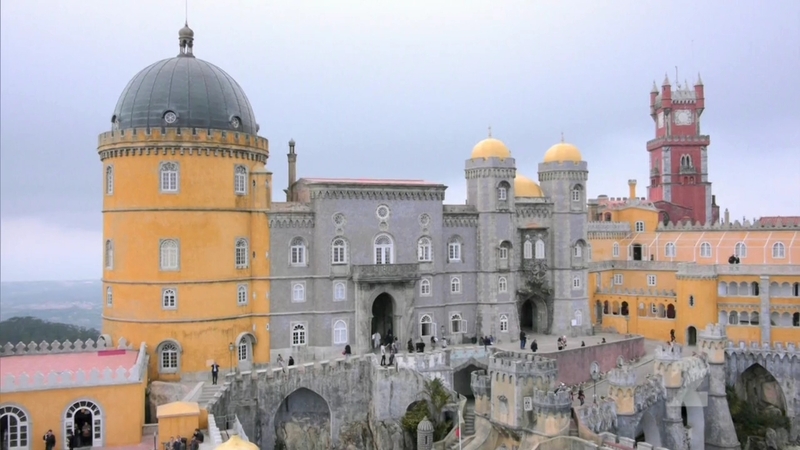 Teams can now head to the Pit Stop at Pena Palace in Sintra. Carla & Hereni see Sally & Tyson heading the other, wrong, way. Daniel & Ryan, not wanting to get lost again, follow the Kiwi mums who they then pass when the mums stop for directions. Ashleigh & Jarrod arrive at the beach and Jarrod does the Road Block. Ashleigh tries to get a frustrated Jarrod to calm down. When he delivers the seafood, he struggles through the stew that he says is definitely not to his liking. At the Pit Stop, it is Daniel & Ryan who arrive first and win two business class roundtrip tickets to Abu Dhabi. Carla & Hereni have to settle for 2nd. It looks to be a footrace between Cat & Jesse and Sally & Tyson. But Tyson has to take another pee break as they run up the hill to the Mat. That allows Cat & Jesse to check-in as Team #3. Sally & Tyson take 4th. Jarrod finally finishes the Road Block and he and Ashleigh head to the Pit Stop, knowing they are in last and hoping this is a Non-Elimination Leg. Ashleigh gets emotional as Jarrod tries to tell her it is okay, they did well. But Grant tells them this is a Non-Elimination Leg and they are still in the Race. They will get a Speed Bump in the next Leg. I thought this was a great episode. I always love when teams are Racing side by side. That’s the good thing about Hours of Operation. And it’s thanks to TARUS’ lack of competition that has made me grow to love equalizers. TARAu has been great at including random tasks in the middle of the night that break the usual waiting for morning opening of a location. Earlier it was tarantula eating, now it was singing. 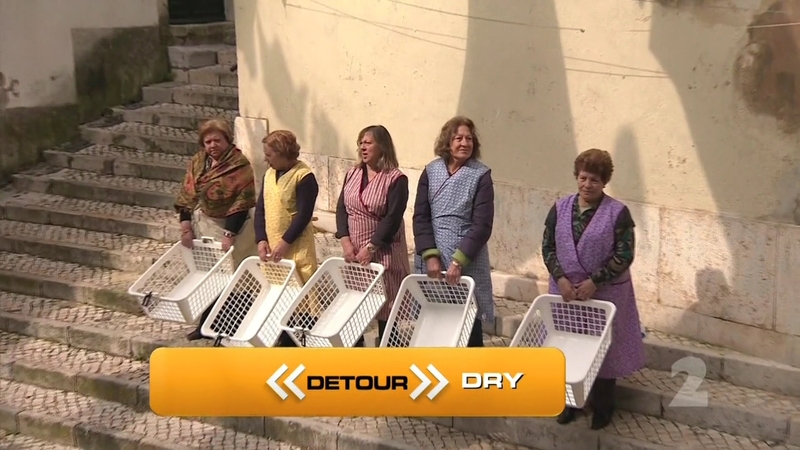 The Detour was a great way to show off Lisbon’s streets and get the teams to interact with the locals. It would’ve been nice to see them interacting more with the nice old ladies though, especially in the laundry side of the Detour. 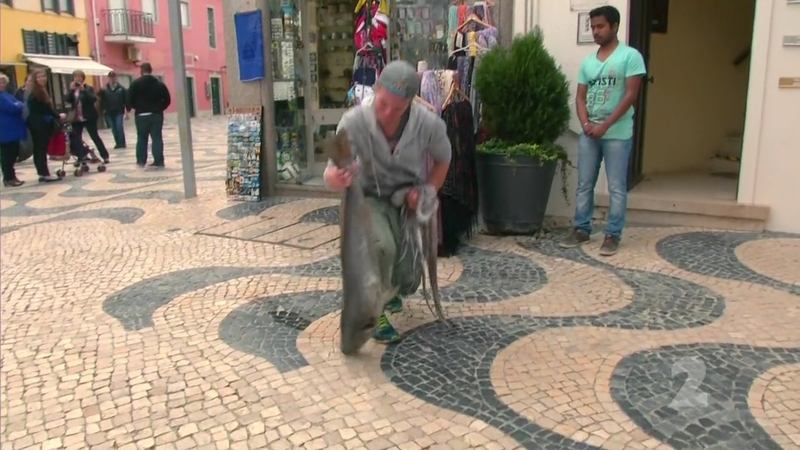 I had to think when the last time TAR went to Portugal, let alone Lisbon and I remembered TAR3’s Lisbon Leg (I definitely remember Torre de Belem) was actually just a half Leg in the city. So it was great for Lisbon to get a full Leg this time. Overall a very nice Leg and a good episode. And I think because of the difficulty of the Detour, an alright place for a Non-Elimination Leg. I could easily rank all five teams as #1, tied. I honestly don’t know who I like more or less. Well maybe a little, but it’s pretty close. And I don’t think that’s ever happened to me before with TAR. Daniel & Ryan are still pretty good, but that could change fast if they start dominating and get less likeable. They will hopefully stop talking about John & Murray in the last few Legs, so that will help. Sally & Tyson are definitely still fun too. I wonder if Tyson’s small bladder will eventually play a bigger part in their fate on the Race? Or is it just part of their charm? Poor Sally with the directions this Leg though. After the first Leg, they’ve been free of navigational trouble and have Raced much better. Hopefully this is a one-time slip. Cat & Jesse did well this Leg. It would’ve been nice to have Cat hustle more in the Road Block though because they were in great position to finish 2nd. Just like Carla & Hereni. They were in excellent position to finally get back on top, but dropped the ball. I think both teams have a big chance to get themselves into the final 3 if they can just step it up. 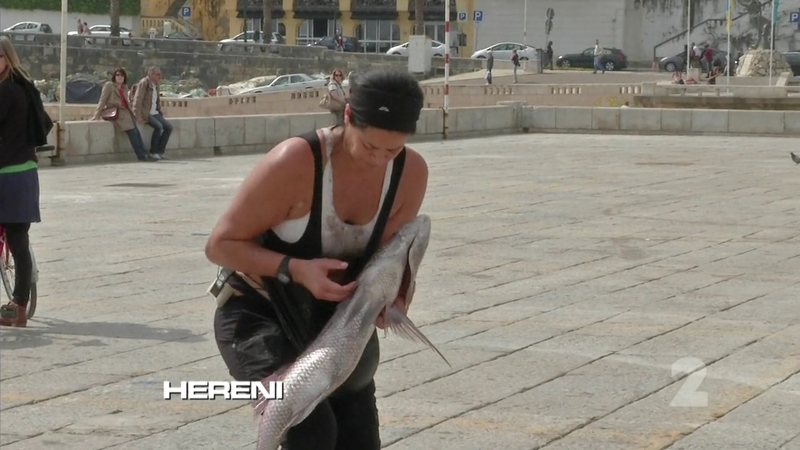 It was great to see Carla & Hereni show signs of their awesomeness again this episode. Ashleigh & Jarrod are very interesting. It was like a trainwreck watching #BloodyJarrod get frustrated all Leg. It was fun, but also started getting kinda old as the Leg went on. Then at the Pit Stop, Jarrod pretty much accepting their elimination with Ashleigh getting emotional after a Leg of staying calm and focused was amazing. ← Recap: Power Rangers (Super) Megaforce, Episode (10) 30 – "Alright! Push on, my friends! Whoever you are."